This is the right place for men that know the difference between a hand-made button hole and a machine-made one. All garments here are vintage, sometimes not even used, and of highest quality. For example suits by brands like A.W Bauer, Aquascutum, Turnbull & Asser and many more. 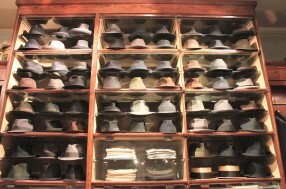 Hand-made brogue shoes and a wide selection of hats, silk scarfs, waistcoats and accessories made between 1920 and 1950 makes this shop quite unique in the world. There is no shop like this in New York, London or Paris that we know of. Do you? The only competitor that we have heard of is Rudolf Beaufay´s clothing store in Hamburg. So next time you visit Stockholm we suggest that you stop by here to have a chat about style with the friendly owner Alexander or maybe buy your own fez and smoking gown before you check in to one of our beautiful homes.